Your time is your most valuable personal--and corporate--asset. You can't do anything without expending some of it. There's only a limited, finite amount of it. You can't replace it. You can't create more of it. You can't stop its progress. Given the inherent value of time, you have to wonder why most of us treat it so lightly. We make too little effort to plan how to make the best use of our time. What plans we make, we often don't follow. We are prone to simply reacting to whatever comes our way rather than setting priorities and sticking to them. Imagine you received a gift of one million dollars. What would you do with it? I've asked that question of many groups I've trained and have received a wide variety of answers: Invest it. Apply it towards retirement or the children's education. Buy a new home. Start a new business. Travel. Give it to charitable causes. These are just a few of the responses. But no one has ever suggested that they'd simply put it in their checking account, spending it whenever the need or impulse struck until it was all gone. Yet think about how we use something of far greater worth than a million dollars--our time. How many of us take a "checking account approach" to life? Pay as you go. No clear plan, little investment, few deposits. Simply spend it until it's all gone. The first step to better time management is fully appreciating how precious it is. The Bible says, "Teach us to number our days, that we may gain a heart of wisdom." Obviously, we don't know the number of our days. But the point is that our days are numbered. We gain a heart of wisdom when we begin to treat our time as the finite, invaluable resource that it is. The Bible also instructs us to "redeem the time." The word redeem in the original language is taken from commerce; it means to buy or purchase. Basically, it involves an exchange of value, usually roughly equivalent value for both what is expended and what is gained. When we redeem time, we seek to spend each increment of time on activity that is of commensurate value. So how valuable is your time? Is it not priceless? The first two choices are fairly obvious, but what does it mean to invest our time? This involves using our time in a way that yields a future return or enhances the value of how we spend time later. Investing time includes things such as getting an education, learning a new skill, teaching someone else, or developing a relationship. Most of us could do a much better job of investing our time. 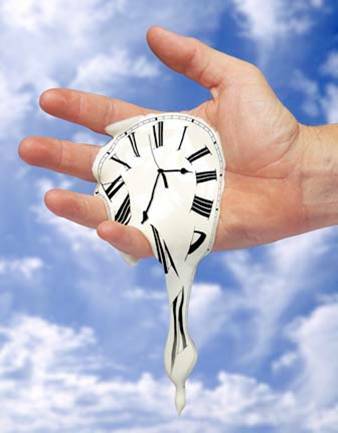 Application to your business: While your personal time is priceless, you do place a monetary value on corporate time. In our business, we have historically sold our services in increments of time. Most have an hourly billing rate, or hourly cost to the firm. This has tremendous ramifications in how you and your colleagues collectively use your time. If you bill an hour to the client, the rate is usually the same whether you are developing an complex design, typing a letter at 30 wpm, or just putting an extra hour on your time sheet to help meet your utilization goal. Obviously, the difference between those choices is very significant, especially when multiple hours are involved. If you fail to manage your time effectively, either the client or your firm is going to pay for it. More likely, you recognize that like life, your days on a project or other assignment are numbered as well. There is a budget established that determines whether the firm makes a profit or the client pays appropriate value for the work delivered. Therefore, you should be highly motivated to make the most of your time at work. Many people simply try to do too much. Perhaps you're one of them. There are far more alternatives for spending our time than we have time to spend. This would seem to dictate that we choose not to do some things. But many people seem intent on trying to cram as many things into their life as possible. Unfortunately, adding more activity often doesn't translate to more productivity or more satisfaction. In fact, it can have exactly the opposite effect. As everyone knows, effective time management involves setting and sticking to priorities. But this is much more difficult in practice than in concept. When training people on this subject, I ask them to list in order the top five priorities in their life. I then ask them to rank the items they listed based on how much time they spend on each. As you might expect, the exercise confirms, with rare exceptions, that we don't spend our time in proportion with our priorities. Why don't our priorities drive our time usage? There are a variety of reasons we might name, including failure to plan, poor choices, lack of discipline, circumstances beyond our control. But probably the most prevalent factor is what some call the "tyranny of the urgent" (which we'll explore below). Application to your business: Companies, like people, also have an unlimited number of choices for the finite amount of time available to spend on them. Similarly, firms are often prone to spread limited resources across too many activities, sometimes failing to excel in any of them. In the process, high priority activities are neglected while lower priority, but urgent, matters consume most of the available time. Sound familiar? 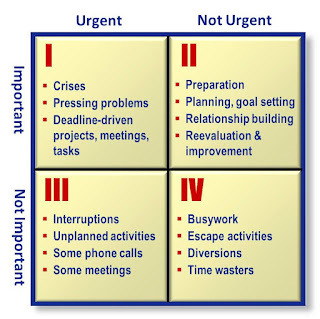 Most of us spend most of our time in Quadrants I and III. Giving attention to Quadrant I is certainly necessary. The problem is when we confuse anything urgent with being important. 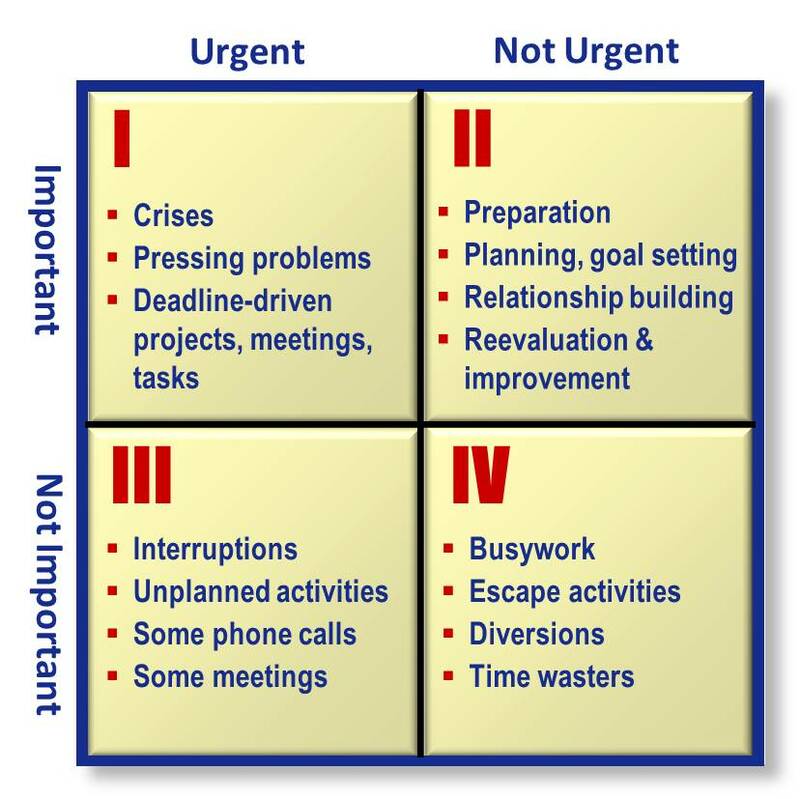 When this happens, the important, non-urgent matters (Quadrant II) typically get shortchanged. Our culture accepts excessive busyness (defined as uncontrolled activity driven by urgency rather than importance) as normative. But this condition comes with substantial costs. I noted one effect; crucial Quadrant II activities get crowded out. Busyness also takes a physical and mental toll. When people are overloaded, their productivity suffers. Many are on the verge of burnout. Application to your business: A/E firms are also vulnerable to the tyranny of the urgent. We use imagery such as "fighting fires" and "trying to keep my head above water" to describe our commonly over-stressed workplaces. The most crucial, strategic corporate initiatives are often displaced. Our firms are then poorly equipped to grow, change, and improve in a time when such outcomes were never more important. Covey's research found that high-performance firms spend 65-80% of their time on strategic Quadrant II activities, a remarkable percentage in comparison with the norm of just 15%. Most firms, like people, spend the bulk of their time in Quadrants I and III. Thus the obvious goal of firms seeking to maximize their time usage is to shift more time from Quadrant III to Quadrant II. Creating Strategic Capacity. Identifying and prioritizing your high payoff activities. Time Management Together. Group strategies for maximizing time productivity. Investing Nonbillable Time. Making the most of this strategic reserve of time.